If you haven't had time topre- book your Tipi Wedding Showcase ticket, just turn up anytime between 11am and 4pm on the day! We'll be delighted to meet up. Come along to our free Tipi Wedding Showcase on Saturday, March 23rd in Herne, Kent to discover our Giant Tipis in all their glory, get advice from the Big Day Event Tipis team and meet some of the best artisan wedding suppliers in the South East. The Tipi Wedding Showcase is the perfect opportunity to experience our unique Giant Tipis setup and get inspired for your Big Day, from picking the right finish for your Giant Tipis, to laying out your space, decorating your venue or finding the right caterer. The Big Day Event Tipis team will be on hand the whole day to chat about all your wedding plans and offer advice on how to organise a unique Tipi Wedding. We have carefully picked the Artisan Wedding Suppliers present on the day: they are some of the best in the South East and will be able to advise you on how to create a stunning event. Exclusive SPRING OFFERS 10% discount off all new Big Day Event Tipis Extras. Free gift for all attendees. Free advice on how to plan your outdoor wedding from the Big Day Event Tipis team. A chance to experience our Giant Tipi set-ups showcasing different layouts and furnishings which we offer. Artisan Wedding Suppliers giving you ideas and advice on how to curate a beautiful event. Tickets to the Tipi Wedding Showcase are FREE. Do I need a ticket to attend your Tipi Wedding Showcase? If you missed our online pre-booking tickets, don't worry! You can just come along on the day, we'll be there from 11am until 4pm. The Tipi Wedding Showcase will take place at the Goody Ales Brewery, in Herne, Kent (CT6 7NP). What time does the Tipi Wedding Showcase start? What time does it finish? The Tipi Wedding Showcase will start at 11am and will run until 4pm. Which suppliers will be present on the day? Who are Big Day Event Tipis? 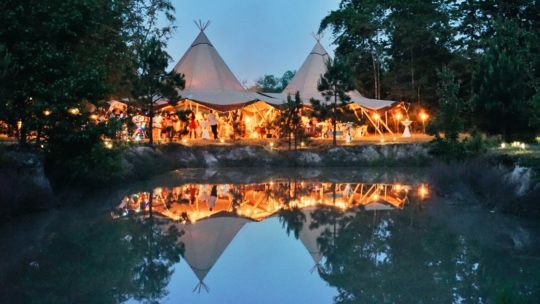 Big Day Event Tipis are a Giant Tipi hire service perfect for Events, Parties + Weddings run by Sonja and Scott, a husband and wife team with a passion for all things outdoors. We are experienced event planners and will help you realise all your wedding dreams every step of the way. Feel free to contact us at hello@bigdayevent.co.uk or call us 07739 739 736.